Saturday morning came with a brisk wind from the South East and a cloud cover threatening rain. John Cruise, the Race Officer had arrived in good time and set the flags and course boards in advance of the 17 competitors for the second “Cockwells Saturday Points” racing and the first of three “Millennium Cup” series for the B & C class working boats. A grumpy Commodore had to fix the asthmatic air horn, yet again. Then it was a long wait at the Flushing quay for our launch as the Chart Datum low water prevented our use of the slipway. At 1355 hrs the three Q class competitors beat away from the club line through the harbour and across the Carrick Roads towards the Castle Buoy taken to port. They were followed 5 minutes later by seven U class yachts all vying for position in the restricted space of the channel at very low tide. Five minutes after that, Sweet Friday, Len Cheshire and Amneris, Mike Robson had an easier start in W class. At 1415 hrs three Gaffers in G class started and completed the race officer's task at the sailing club. Meanwhile further down the harbour the indefatigable Jack Penty in Noon Hi started the two B class working boats for the start of the “Millennium Cup” series races. Winnie, Arthur Williams and Cousin Jinny, Graham Pearce, looked resplendent with their topsails pulling in the fresh wind. We had an inauspicious start on Trifle as the boat was being set up as we approached the start line. We were last of the pack and had some serious catching up to do. The crew worked hard as we did a series of short tacks out of the harbour and eventually managed to clear our air past the Frigate buoy. We saw Gap Year, Lenny Trenoweth powering away toward the eastern shore followed by Aurora, Mandy Owens and Wilkie, Bob Chapple. Some boats to leeward of us tacked away toward the docks but we held on and followed Wilkie out into the Carrick Roads. One tack then took us between the Governor buoy and the Western Shore and we found that a couple of boats had already fallen behind us. Gap Year, Aurora and Wilkie all tacked just after the Governor so we held on till nearly Black Rock had been reached. We had a big lift towards the Castle Buoy and then tacked on a big header. Gap Year was first around followed by Aurora and the Wilkie. We had made it into 4th place. A starboard pole spinnaker run back to the Vilt buoy taken to port followed and we could see General Khaos, Ian Jakeways in Q class with a commanding lead ahead of Tai Mo Shan, Neil Chamberlain and Minx, Charles Choak. Gap Year gybed at the Vilt mark in 1st place followed by Aurora without spinnaker. Wilkie elected to drop their kite. We did a great gybe, only the second one ever for Finn 14 yrs and Sonny 10 yrs my great crew, well done guys. A port pole reach and run back toward the sailing club ensued and we saw the Q class yachts coming out for their second round. 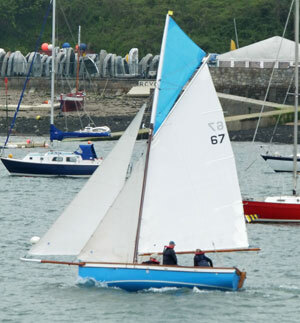 U class then followed with a shorter second course of Governor to port, Trefusis to port and finish. It was great to see the familiar bright blue hull and stripped spinnaker of Katy, Sue Grigg leading the G class yachts up the harbour as we went for round two. General Khaos took line honours but was beaten into first place on handicap corrected time by Tai Mo Shan. Well-done Neil. Charles Choak and his Saga team Minx brought up the rear for Q class. Gap Year was a clear 3 minutes 30 seconds ahead of Aurora who was beaten on the water by 22 seconds by Wilkie. However Aurora had a whopping 4 minutes 9 seconds adjustment on handicap over Wilkie putting her into second place in U class. Sweet Friday took line honours beating Amneris into second place in W class and Katy, Sue Grigg beat Clementine into second place. Delilah retired as she did not finish in G class. 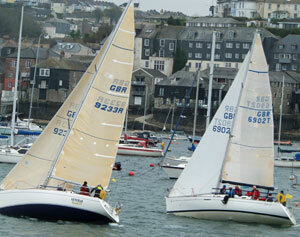 Winnie helmed by Arty Williams of the Cove Restaurant beat the Cousin Jinny syndicate by a good margin. Nina Richards provided teas and superb home baked cakes at the club, which filled up rapidly with thirsty and hungry crews all mulling over the days sport. Thanks to Inez and Sue in the ops room for radio and results.